Posted on July 16, 2013 | Comments Off on Sugar – How Much Is Too Much? Sugar, or sucrose, is a simple carbohydrate that occurs naturally in fruits and vegetables, especially sugar cane and sugar beets. In the human body, simple sugars are metabolized quickly and are easily broken down to form glucose. Glucose fuels the body and is a critical energy source for all cellular and bodily functions, particularly brain function. The brain requires a continuous source of glucose to meet its high energy needs and utilizes 25% of the body’s total glucose production. In the region of the brain known as the hypothalamus, the body’s available energy supply is monitored minute to minute. It keeps track of how much long-term energy is stored in fat, monitors the body’s blood glucose levels and is wired to other brain areas that control taste, reward, memory, emotion and higher-level decision making. Together these brain regions form an integrated circuit designed to control appetite and the desire to eat. Added sugars include any sugars or sweeteners that are added to foods and beverages during processing or preparation. Added sugars can include natural sugars as well as chemically manufactured sugars. The American Heart Association recommends that women consume no more than 6 teaspoons (24 grams) of added sugar, equal to about 100 calories, each day. For men, the recommended limit is 9 teaspoons (36 grams) and 150 calories. According to the U.S. Department of Agriculture, Americans consume 156 pounds of sugar each year, which translates to more than 30 teaspoons (120 grams) per day. 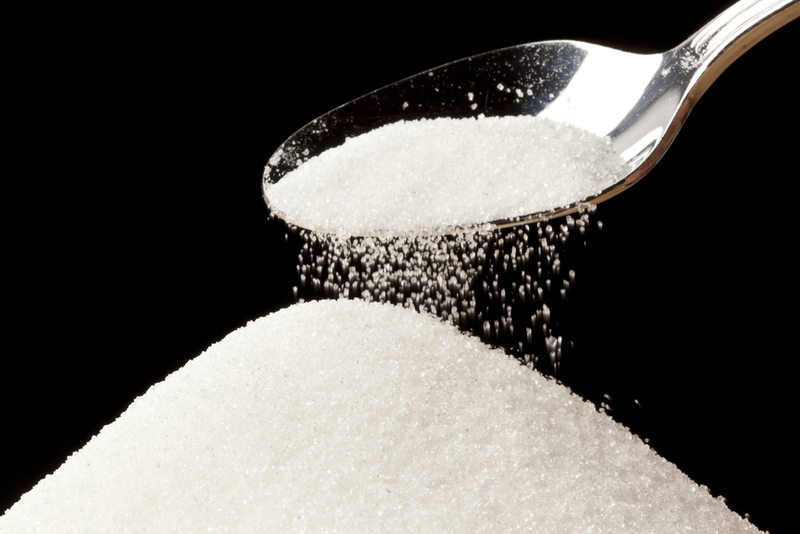 Approximately 29 pounds of our annual intake comes from traditional refined sugar. A large chunk, or approximately 26%, of added sugar comes from processed foods. The number one source of sugar in American diets comes from soda and fruit drinks, followed by candy, cakes, cookies and pies. With 8 teaspoons of added sugar, a regular 12-ounce soft drink will put most women over the daily limit. Too much sugar relates to too many calories that have little or no nutritional value. Added sugar is contributing to American consumption of too many discretionary calories, the number of calories remaining after a person eats the foods needed to meet nutrient requirements. These excess calories not only increase our weight, they wreak havoc on our liver, negatively affect our metabolism, impair brain function and open the door for heart disease, diabetes and obesity. Calculating sugar intake can be challenging as labeling does not differentiate between added sugar and naturally occurring sugars. There are over 50 names for added sugar. To check for added sugar, look at your product ingredients for the following: sugar, glucose, honey, sorghum syrup, lactose, fruit juice concentrate, high-fructose corn syrup, evaporated cane juice, dextrose, fructose, sorbitol, molasses, maltose, corn sweetener, sucrose, brown sugar and syrup. It’s best to remember, that sugar by any other name is still sugar, and with sugar a little goes a long way. The American Heart Association recommends that most of our sugar intake be in the form of complex carbohydrates, such as those found in whole grains, fruits and vegetables, which take longer to digest and provide steady blood sugar levels and sustained energy. Complex carbohydrates provide fiber, vitamins and minerals and phytonutrients. A two ounce candy bar has approximately 30 grams of sugar, the same calorie count as three medium bananas. The candy bar will spike your blood sugar, provide empty calories and won’t satisfy your hunger. The bananas contain no added sugar, are low in fat, high in vitamins and minerals and are fiber-rich. Eating the banana will make you feel fuller and you’ll stay fuller longer. Eat more fresh fruit. Low density foods such as apples, oranges and other fruits are low calorie, nutritious and loaded with fiber. Opt for plain yogurt with fresh fruit as opposed to sugar-laden fruit flavored yogurts. If you are going to drink fruit juice, make sure it is 100% fruit juice, not juice drinks that have added sugar. Remember, one standard glass of apple juice can contain 4 apples without the fiber and other nutrients present in fruit. Consider having a half glass of juice with sparkling water added. Watch for sugar in breakfast cereals. Healthy breakfast cereals can contain sugar but skip the non-nutritious sugar coated or frosted cereals. Look for cereals that have no more than 8 grams of sugar per serving. Better yet, opt for oatmeal and pay attention to serving sizes. It may take multiple servings to fill your cereal bowl. Read the label on all your products. Even peanut butter can have added sugar. Look for natural peanut butter containing only peanuts and salt. Make the decision to stop eating too much sugar. Grant yourself a daily sugar quota and stick to it. Sugar is addictive. As your taste buds adapt to a lower sugar consumption, your cravings will decrease and you’ll be satisfied with less. Cut back on dessert. Dessert should be an occasional treat. Opt for fruit instead or a small serving of ice cream if you haven’t reached your daily quota for sugar. Don’t add sugar to foods. Many recipes for sauces or casseroles call for sugar as an ingredient. In most cases, the extra sweetener is not necessary and you likely won’t notice any difference in taste. Avoid foods that list sugar as one of the first three ingredients on the label. Remember any ingredients that end in “ose” such as sucrose, glucose, dextrose, fructose and maltose, are all sugar aliases. Eating less sugar is about preserving your health. Strive for the World Health Organization’s recommendation of sugar comprising no more than 10 % of your daily diet. Remind yourself that, as you wean off sugar, there are benefits to having less sugar in your life. It may take time to get off the sugar bandwagon, but your heart, your waistline and your overall health will reap the benefits. Wellness Essentials Healthy Balance by Metagenics – When taken as part of a healthy diet, Wellness Essentials Healthy Balance is formulated to target unique nutritional needs to help maintain healthy blood sugar levels already in the normal range. Gluco-Support by Douglas Laboratories – This product offers a synergistic and comprehensive combination of vitamins, minerals, herbals, and other nutrients carefully formulated and specifically designed to offer nutritional support for healthy glucose metabolism. UltraLean Gluco-Support Bar by BioGenesis Nutraceuticals – This functional food bar is designed for weight control and blood sugar stability. Completely fortified for balancing blood sugar and increasing energy. Supports lean body mass maintenance. This entry was posted in Health & Wellness, Home and tagged blood sugar support, Gluco-Support by Douglas Laboratories, sugar, UltraLean Gluco-Support Bar by BioGenesis Nutraceuticals, Wellness Essentials Healthy Balance by Metagenics. Bookmark the permalink.